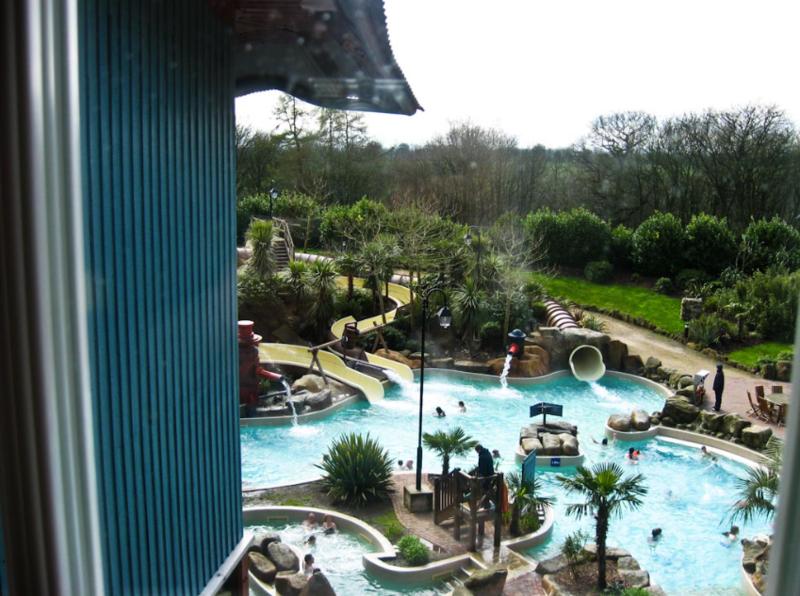 Waterpark – TowersStreet - Your premier Alton Towers guide! 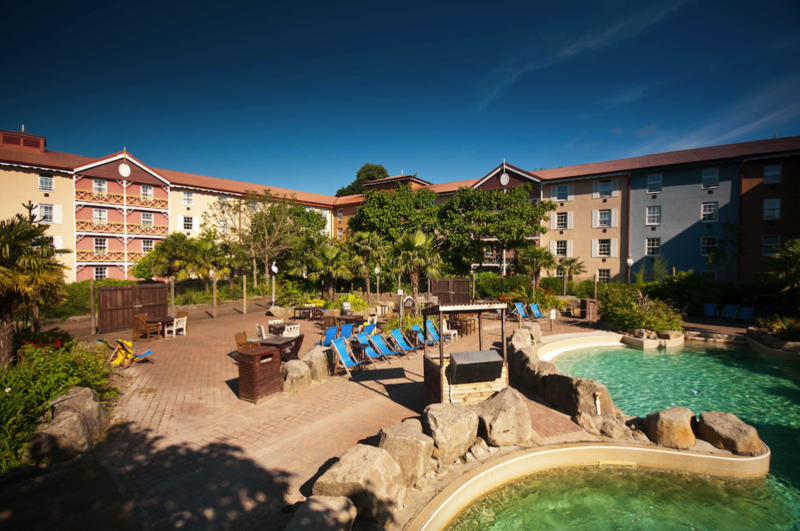 Nestled at the heart of Splash Landings Hotel you’ll find the totally tropical Alton Towers Waterpark. Here the weather is always balmy… and the plumbing slightly crazy! Don your swimwear, grab a rubber ring and throw yourself into this fun-filled water adventure! The Alton Towers Waterpark is almost fully enclosed, and is attached to the Splash Landings Hotel. It is open all year round and contains indoor and outdoor slides for all the family, as well as interactive play equipment for the younger visitors. 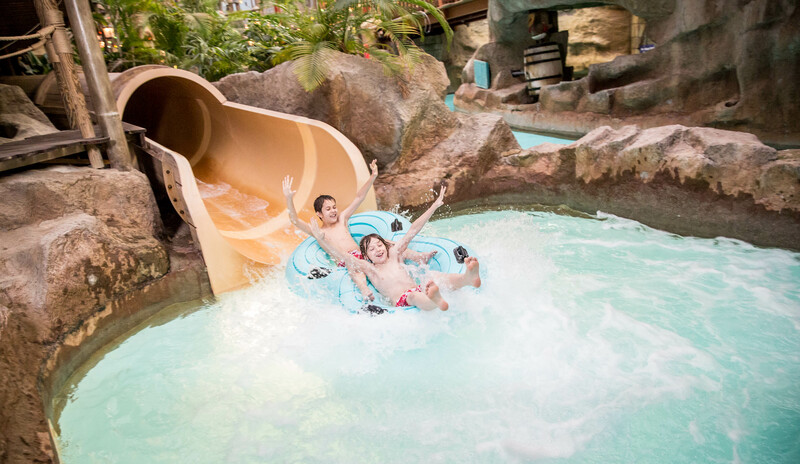 The Waterpark continues with the tropical Caribbean theme of Splash Landings and sports palm trees, bright paint and quirky designs like the rest of the hotel. The water park entrance is on the bottom floor of the Splash Landings Hotel, and is signposted from the hotel reception area. It is also easily accessible from the Alton Towers Hotel too, as it is signposted from the sky-walk between the hotels. If needed you can hire towels at the waterpark reception for a small fee, and swim wear can be bought at the shop next door (though the selection is limited and prices are higher than the high street). The water park often gets busy on weekends during the theme park season and school holidays, and in the winter expect it to be very busy during any themed weekends. The outdoor part of the waterpark will open in cold weather but it tends to open for a shorter period than the indoor parts so to be sure to experience this area while its available. If you have children please ensure that you have enough adults to meet minimum safety requirements set by the park to ensure your child’s safety in a busy environment. Always check the official Alton Towers website to ensure the waterpark is open when you want to visit, especially in January when it often closes for maintenance. Master Blaster is a thrilling slide that takes you around the perimeter of the water park on a rubber ring, flying down drops and shooting up hills using high speed water jets to propel you along. This slide is the most thrilling of the three at the water park and uses both single and double rings. It is great fun for the whole family (and don’t forget to smile for the camera at the end!). Rush and Rampage are two separate fully enclosed slides located on the same level as Master Blaster’s starting platform, and also require a ring. One of the slides is a lot darker and a lot faster than the other, so our top advice is to try them both and see which one you like best. They both exit in the splash pool linked onto the Lazy River, but you must hand back your ring and re-queue if you want a go on the other slide. Flash Floods is the outdoor slide section of the water park, which has its own operating times and can also be affected by inclement weather. 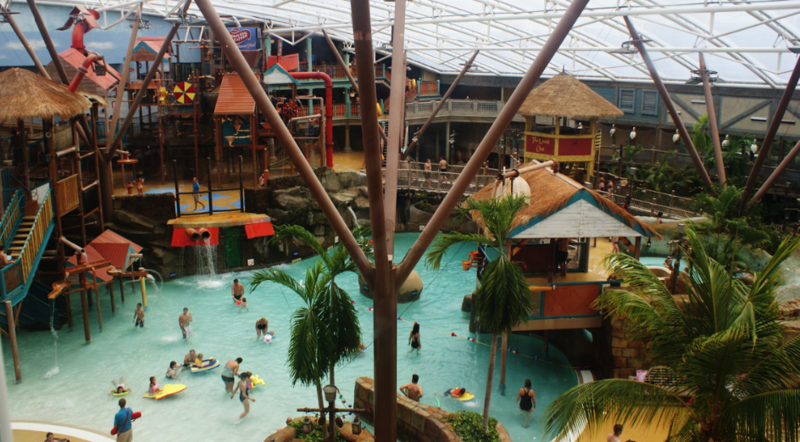 The entrance can be found on the upper level of the waterpark and takes you to an outdoor pool where you have a choice of two open slides, both leading to a middle landing pool. From the middle landing pool, you have a choice of three slides (one enclosed, two open) which take you to the bottom landing pool and to the end of your journey. As well as slides, the Alton Towers Water park offers a number of other attractions for the whole family to enjoy. 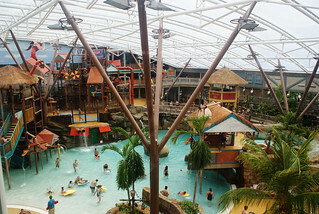 The main pool at the centre of the fun contains a giant water hydrant, spewing a constant stream of water into the air and back down into the pool. This pool starts off very shallow, and has a maximum depth at the far end of 1.4m. From Lagoona Bay you can access the Lazy River and Wacky Waterworks tree house. 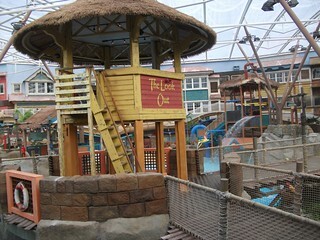 Wacky Waterworks is home to a large number of interactive water features that everyone can have fun with. There are wheels to turn, ropes to pull, buckets to tip and funnels to open, all which trigger watery reactions! You can target others in the tree house or take aim at other unsuspecting guests in Lagoona Bay. Some of the water guns even target the Master Blaster water slide – but you will need good aim! Little Leak is situated to the side of the waterpark, and is a dedicated area for smaller children to play, with its own pool, smaller water features, and gentle slides. Parents are encouraged to keep an eye on their little ones and can join in with the fun. Volcanic Springs is the indoor bubble pool, and Bubbly Wubbly the outdoor bubble pool. Both are perfect for relaxing whilst the hustle and bustle of excitement continues around you. A lot warmer than the other pools, Volcanic Springs and Bubbly Wubbly have a number of high power jets of bubbles pumping around the seating area, letting you sit back and enjoy a massage. Both pools have age restrictions of 5+. One of the main features of the Alton Towers Water park is the Tipping Bucket. 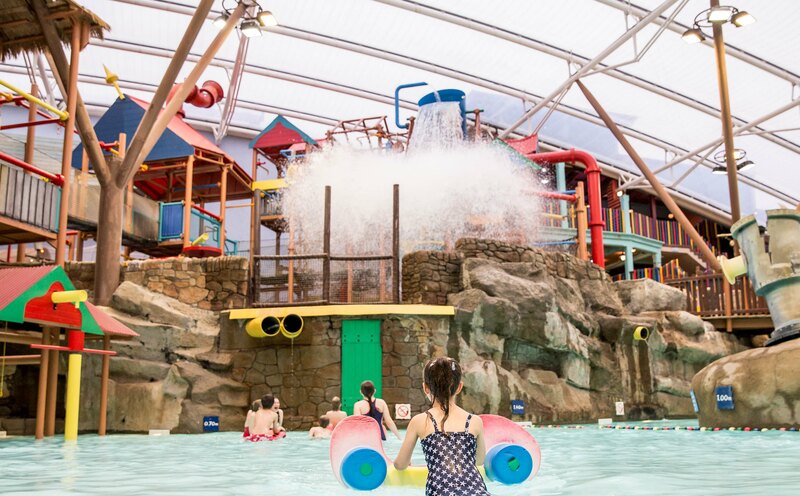 Every few minutes, the enclosed water park hears the chimes of a bell, and is then treated to the spectacular sight of 1,000 litres of water cascading from the giant bucket onto the area (and guests!) below. The bucket itself is housed on the top of the Wacky Waterworks Tree house, with the water falling onto the spongy surface below. 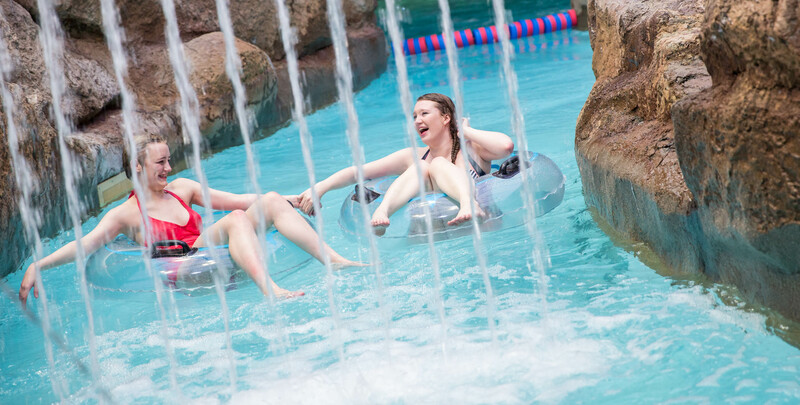 You’ve got two options for the Lazy River – grab a rubber ring or just swim! The current will pull you along slowly, but watch out for the leaky pipes, waterfalls and tipping buckets on the way! The single person rings will be floating freely around the course, and become available when other guests are done with them. If you need a break from the hectic goings on in the water park, then book a treatment in the spa treatment room. Treatments come in 25 and 55 minute varieties and include facials, full body massage and scalp massage. Please note that some attractions are subject to height or other restrictions, for more details, see the official Alton Towers website. Food and drink is available in the waterpark and the range includes ice creams, smoothies, sandwiches, salads, fruit pots, hot drinks and more. Seating is provided in a designated area, though this can get very busy at lunchtime. 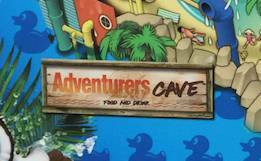 With a little bit of something to suit everyone, the Adventurer’s Cave will ensure you’re fed and watered during your splish-splashing time at the Waterpark. Don’t forget your Merlin Annual Pass for discount! With a wide range of ice creams, floats, waffles and sundaes available for the taking, the Ice Cream Shack is ideal on any day, since the indoor section of the Water Park can get very warm! Everyone wants to have a great time, but to make sure everyone is safe too, lifeguards can be found throughout the park, as well as in The Look Out at the centre of the park. With safety in mind, there is a strict adult to child ratio requirement for anyone entering the waterpark. For up to date information on this, we recommend checking the Alton Towers website. The changing rooms offer both individual and family cubicles for convenience. Showers are available for use by the pool entrance, and toilets are located nearby in the same area. Towels and lockers are available to hire for a small fee, and hair-driers are available by the entrance/exit doors. The water park undergoes maintenance at scheduled intervals (usually annually) during the quieter winter periods, and so its advisable to check availability if you’re staying out-of-season. Forgotten something? 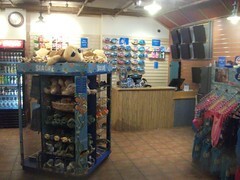 This small shop can be found by the water park entrance for all the essentials you might need for your tropical adventure, such as swimwear and accessories. Before you leave the waterpark make sure you head back the shop to view your Master Blaster photo too! For more details on Cariba Creek’s construction, please see our development archive. 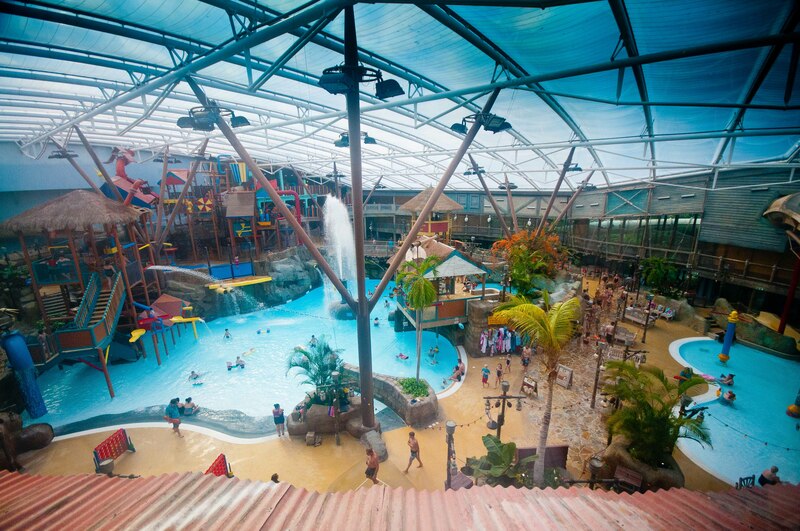 When the waterpark first opened its doors on 1st June 2003, it was only available to guests of the Alton Towers or Splash Landings Hotels. From 2004, non-resident guests were allowed to use the water park for an additional fee. There hasn’t been a great deal of physical change to the water park over the year’s aside from sponsorship deals (Imperial Leather) and a progressive, ongoing name change between 2011/2012 from Cariba Creek to Alton Towers Water Park – you’ll still see signs for both names around the waterpark. 2014 saw the first completely new addition to the waterpark since Cariba Creek opened in 2003, with the addition of a new Spa Treatment Room. Quenchers was the previous catering offering of choice for the Alton Towers Water Park. 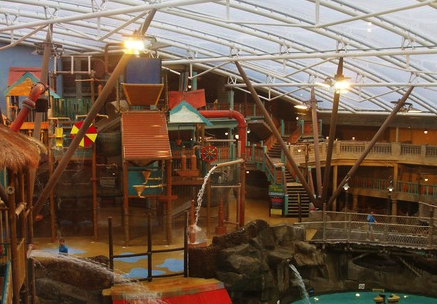 It opened with the waterpark in 2003 and was the waterpark’s internal café-bar through to 2012, when it was replaced by the Original Sandwich Co. and then Adventurers Cave in 2016.